Application Lifecycle Management: a Tool for Project Managers? Historically, Application Lifecycle Management tools have evolved to support the work of software developers. As software architectures were (and still are) getting more and more complex, development teams were finding it increasingly difficult to keep track of work items, processes, relations between artifacts, and other important details using their old tools. They needed a way to organize development work throughout the lifecycle in a structured manner. Thus, integrated Application Lifecycle Management tools were born. However, integrated ALM is not only beneficial for developers. In fact, with codeBeamer ALM, managers greatly appreciate the transparency and efficient monitoring that our tool provides. Why so? Let's find out! Project managers need to monitor, measure, and report on the development team's work and performance continuously. Having all your lifecycle data in a single repository helps a great deal, but ALM solutions traditionally aren't too good in letting you access that data. With codeBeamer ALM's cutting edge Business Intelligence features to support management decisions, you'll have valuable insights to what's happening in your development – whether you are a project manager working on the team level, or an executive worried about higher level business aspects. For day-to-day task management, configurable Kanban boards greatly help project managers oversee activities and identify bottlenecks. A burndown chart, and granular release statistics are offered by default, supporting future effort (time and cost) estimation. Traceability is recorded automatically, while various QA & testing features help ensure the high quality of the end product. Project managers can stay on top of all activities, and investigate any delays or issues immediately. What makes codeBeamer ALM so special among integrated ALM tools is that in addition to giving project managers a powerful management tool, it also offers executives the ability to connect strategic business KPIs and monitor alignment, performance, and product quality. 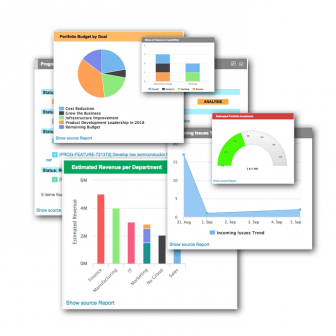 codeBeamer's Business Intelligence feature set is unique among integrated ALM tools. These capabilities allow you to set up custom reports about practically anything throughout the lifecycle. Is it the number of burnt story points per sprint you're interested in? Simply visualize the adequate report using a bar chart with just a few clicks. Are you trying to measure if your testing team is sufficiently staffed? Set up a quick report on all artifacts waiting to be tested / testing completed per team member, and the chart will show you each team member's workload. You can easily make informed business decisions based on real lifecycle data. Preparation for compliance audits is also hugely simplified: simply pull a report on traceability, risk management activities, QA, or practically any other aspect of your lifecycle, and export it with just a few clicks. codeBeamer ALM's reporting functionality lets you set up custom queries to filter for any data throughout the lifecycle, and allows you to visualize everything using built-in charts. Custom reports enable real-time data analysis, a unique feature that software executives see the real value of. Your reports are kept up-to-date at all times, and may be simply shared or exported to support decision-making on an ongoing basis.